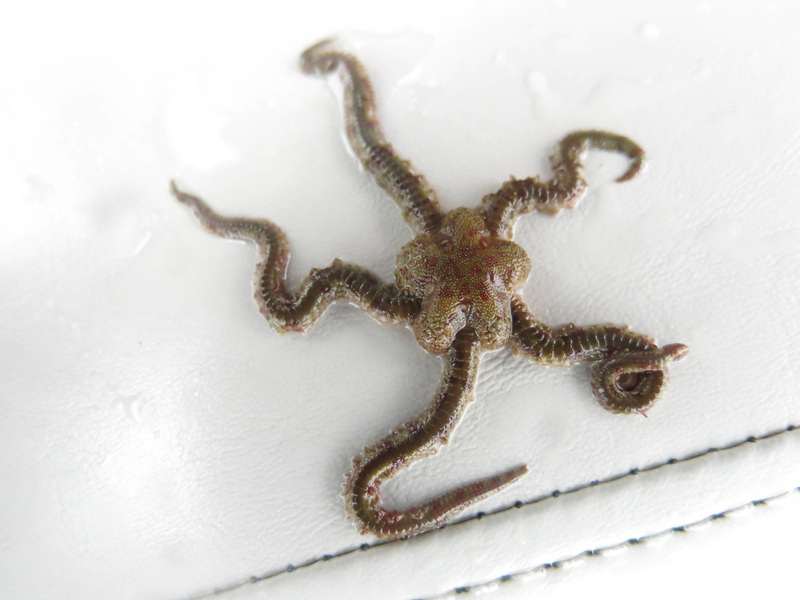 The daisy brittle star is very variable in both colour and pattern. It is often blotched or striped with red or brown, or sometimes green. The key identifying characteristic for this species is the arrangement of the aboral (dorsal) plates on the brittle star's rays (arms): the oval-shaped primary plates aligned along each ray's midline are interspersed with smaller secondary plates as well as edged with smaller plates. This arrangement makes the primary plates appear ringed by the smaller plates.This is unlike other brittle stars found in this region, which have each primary plate placed directly adjacent to the next. Each lateral plate bears five spines. 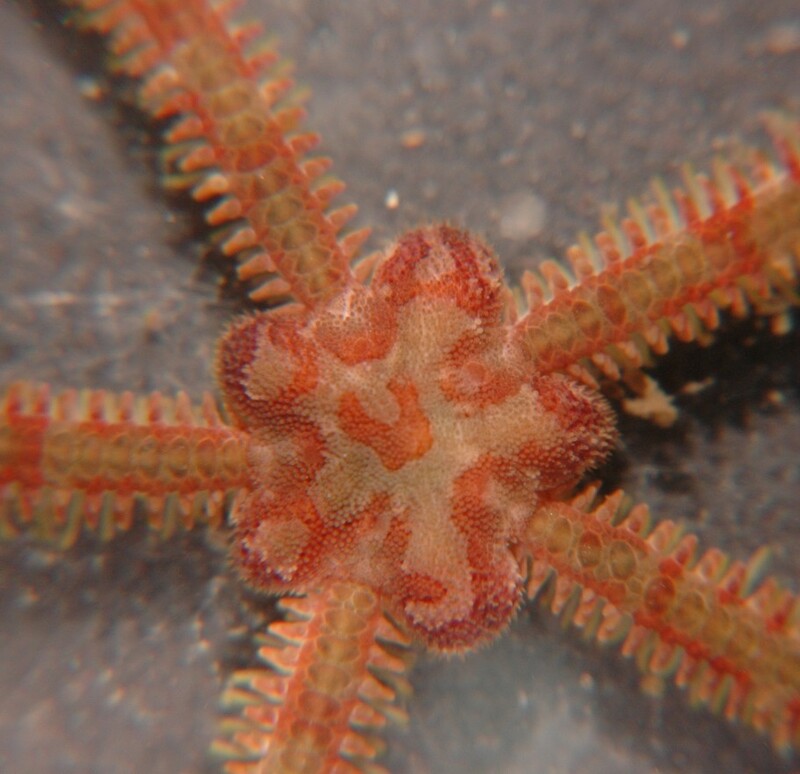 The daisy brittle star reaches 20 cm in diameter. 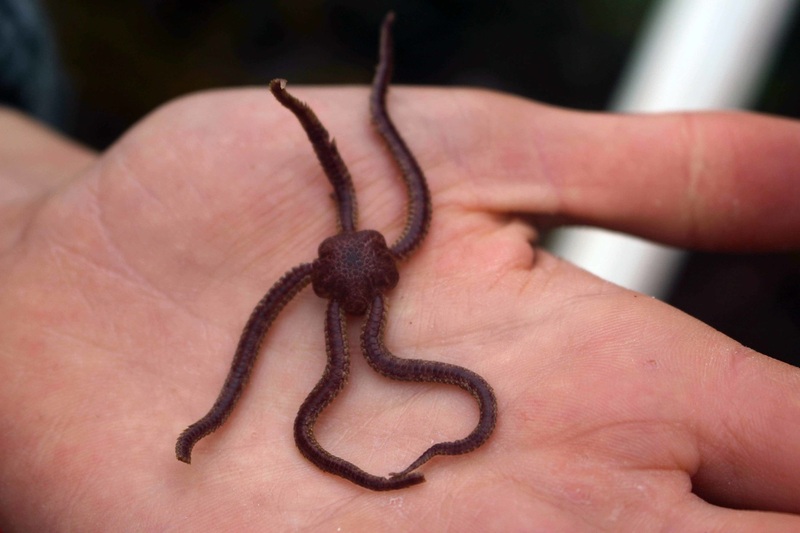 The daisy brittle star is one of the more common brittle stars along rocky shorelines in the Pacific Northwest, and unlike many brittle stars it inhabits the intertidal and so may be found by beachcombers (more than half of the region's brittle stars are found below 200 m). The daisy brittle star inhabits areas with strong currents, from the lower intertidal to as deep as 2000 m. It tends to hide in rock crevices and amongst shell debris, often with its arms projected out to catch suspended prey. It is found throughout northern temperate oceans; it range along the west coast of North America extends from northern Alaska to southern California. Cowles, D. (2006). Ophiopholis aculeata (Linnaeus, 1767). Invertebrates of the Salish Sea. Rosario Beach Marine Laboratory. Accessed 28/10/2015. Daisy Brittle Star, Ophiopholis aculeata. Alaska Fisheries Science Centre. NOAA Fisheries. Accessed 28/10/2015. Picton, B.E. & Morrow, C.C. (2015). Ophiopholis aculeata (Linnaeus, 1767). [In] Encyclopedia of Marine Life of Britain and Ireland. Accessed 28/10/2015.